He approved the idea of military intervention in Iraq to prevent the genocide now taking place at the hands of jihadists, saying there was a clear “unjust aggressor who “must be stopped”. But he said no one state can decide to intervene by itself, and that the UN should decide on the best means to stop the aggressor. John Allen describes it as a “cautious yellow light”. See his backgrounder here. He said that the beatification process of Archbishop Oscar Romero, gunned down at the altar in 1980, has now been “unblocked”, having been “blocked” before. This is not, in fact, news: the promoters of his cause said it had been unblocked and was moving apace a year ago, but it is being reported by the BBC now. He confirmed his visit to the United States in September 2015, and strongly suggested that he would go to New York and Washington as well. He also said he would visit China tomorrow if he could, and hoped for good relations with Beijing. He rejected the suggestion that the Prayer for Peace in the Holy Land on June 8 was a failure, and emphasized that “it has opened a door” that still remains open. What follows is an unofficial translation and transcript by one of the journalists on the papal plane, Gerry O’Connell, Vatican correspondent of America magazine. Q. During the visit to Korea, you reached out to the families of the Sewol ferry disaster and consoled them. Two questions: What did you feel when you met them? And were you not concerned that your action could be misinterpreted politically? A. When you find yourself in front of human suffering, you have to do what your heart brings you to do. Then later they might say, he did this because he had a political intention, or something else They can say everything. But when you think of these men, these women, fathers and mothers who have lost their children, brothers and sisters who have lost brothers and sisters, and the very great pain of such a catastrophe.. my heart. I am a priest, I feel that I have to come close to them, I feel that way. That’s first. I know that the consolation that I can give, my words, are not a remedy. I cannot give new life to those that are dead. But human closeness in these moments gives us strength, solidarity. And I want to say something more. I took this ribbon (from relatives of the Sewold ferry disaster, which I am wearing) out of solidarity with them, and after half a day someone came close to me and said “it is better remove it, you should be neutral. But listen, one cannot be neutral about human pain. I responded in that way. That’s how I felt. Q. To return to Iraq. Like Cardinal Filoni and the head of the Dominicans, would you be ready to support a military intervention in Iraq to stop the Jihadists? And I have another question: do you think of going one day to Iraq, perhaps to Kurdistan to sustain the Christian refugees who wait for you, and to pray with them in this land where they have lived for 2000 years? A. Not long ago I was with the Governor Barzani of Kurdistan. He had very clear ideas about the situation and how to find solutions, but that was before this unjust aggression. I have responded to the first question. I am only in the agreement in the fact that when there is an unjust aggressor he is to be stopped. Yes, I am willing (to go there). But I think I can say this, when we heard with my collaborators about the killings of the religious minorities, the problem at that moment in Kurdistan was that they could not receive so many people. It’s a problem that one can understand. What can be done? We thought about many things. First of all a communique was issued by Fr Lombardi in my name. Afterwards that communique was sent to all the nunciatures so that it be communicated to governments. Then we wrote a letter to the Secretary General of the United Nations.. Many things …. And at the end we decided to send our personal envoy – Cardinal Filoni, and I said if it were necessary when we return from Korea we can go there. It was one of the possibilities. This is my answer. I am willing (to go there). At the moment it is not the best thing to do, but I am ready for this. Q. My question is about China. China allowed you to fly over its airspace. The telegram that you sent (en route to Korea) was received without negative comments. Do you think these are step forward towards a possible dialogue? And have you a desire to go to China? [Father Lombardi intervenes.] I can inform you that we are now flying in the airspace over China at this moment. So the question is pertinent. A. When we were about to enter into the Chinese airspace (en route to Korea), I was in the cockpit with the pilots, and one of them showed me a register and said, we’re only ten minutes away from entering the Chinese airspace, we must ask authorization. One always asks for this. It’s a normal thing, one asks for it from each country. And I heard how they asked for the authorization, how they responded. I was a witness to this. The pilot then said we send a telegram, but I don’t know how they did it. Then I left them and I returned to my place and I prayed a lot for that beautiful and noble Chinese people, a wise people. I think of the great wise men of China, I think of the history of science and wisdom. And we Jesuits have a history there with Father Ricci. All these things came into my mind. If I want to go to China? For sure! To-morrow! We respect the Chinese people. The Church only asks for liberty for its task, for its work. There’s no other condition. Then we should not forget that fundamental letter for the Chinese problems which was the one sent to the Chinese by Pope Benedict XVI. This letter is actual (relevant) today. It is actual. It’s good to re-read it. The Holy See is always open to contacts Always. Because it has a true esteem for the Chinese people. Q. Your next journey will be to Albania and perhaps Iraq. After the Philippines and Sri Lanka, where will you go in 2015? And can I say that in Avila, there is great hope (that you will come), can they still hope? A. Yes! The woman President of the Korea said to me, in perfect Spanish!, hope is the last thing one loses. She said that to me referring to the unification of Korea. One can always hope, but is not decided. Let me explain. This year Albania is envisaged. 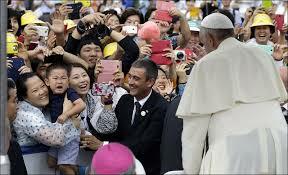 Some have begun to say that the Pope is starting everything from the periphery. But I am going to Albania for two important motives. First, because they have been able to form a government – just think of the Balkans, they have been able to form a government of national unity with Muslims, Orthodox and Catholics, with an interreligious council that helps a lot and is balanced. This is good, and harmonious. The presence of the Pope wishes to say to all the peoples (of the world) that it’s possible to work together. I felt it as a real help to that noble people. And there’s another thing, if we think about the history of Albania, in terms of religion is was the only country in the communist world to have in its constitution practical atheism. So if you went to mass it was against the constitution. And then, one of the ministers told me that 1820 churches were destroyed, both Orthodox and Catholic, at that time. Then other churches were transformed into theatres, cinemas, dance halls. So I just felt that I had to go. It’s close, just one day. Next year I would like to go to Philadelphia, for the meeting of the families. Then, I have been invited by the President of the United States to the American Congress. And also the Secretary General of the United Nations has also invited me to the Secretariat of the UN in New York. So maybe the three cities together. Then there’s Mexico. The Mexicans want me to go to the Shrine of Our Lady of Guadalupe, so we could take advantage of that too (during the US visit), but it’s not certain. And lastly Spain. The Spanish Royals have invited me. The bishops have invited me, but there is a shower of invitations to go to Spain, and maybe it is possible, but there is nothing sure, so I’ll just say that maybe to go to Avila in the morning and return in the afternoon if it were possible, but nothing is decided. So one can still hope. Q. What kind of relationship is there between you and Benedict XVI? Do you have a regular exchange of opinions? Is there a common project after the encyclical (Light of Faith)? A. We see each other. Before I departed (for Korea) I went to visit him. Two weeks earlier he sent me an interesting written text and he asked my opinion on it. We have a normal relationship. I return to this idea, which may not be liked by some theologian, I am not a theologian, but I think that the emeritus-pope is not an exception. But after many centuries he is the first emeritus. Let us think about what he said, I have got old, I do not have the strength. It was a beautiful gesture of nobility, of humility and courage. But if one thinks that 70 years ago emeritus bishops also were an exception. They did not exist, but today emeritus bishops are an institution. I think that the emeritus pope is already an institution because our life gets longer and at a certain age there isn’t the capacity to govern well because the body gets tired, and maybe one’s health is good but there isn’t the capacity to carry forward all the problems of a government like that of the Church. I think that Pope Benedict made this gesture of emeritus popes. May, as I said before, some theologian may say this is not right, but I think this way. The centuries will tell us if this so or not. Let’s see. But you could say to me, if you at some time felt you could not go forward, I would do the same! I would do the same. I would pray, but I would do the same. He (Benedict) opened a door that is institutional, not exceptional. Our relationship is truly that of brothers. But I also said that I felt as if I have a grandfather at home because of his wisdom. He is a man of wisdom, of nuance that is good for me to hear him. And he encourages me sufficiently too. That’s the relationship I have with him. Q. You have met the people who suffered. 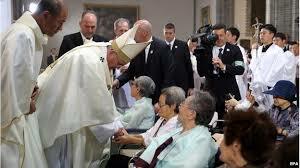 What did you feel when you greeted the comfort women at mass this morning? And as regards the suffering of people in Korea there were also Christians hidden in Japan, and next year will the 150th anniversary of their era of Nero. Would it be possible to pray for them together with you at Nagasaki? A. It would be most beautiful. I have been invited both by the Government and by the Bishops. I have been invited. As for the suffering, you return to one of the first questions. The Korean people are a people who did not lose their dignity. It was a people that was invaded, humiliated. It suffered wars and now it is divided. Yesterday, when I went to the meeting with young people (at Haemi), I visited the museum of the martyrs there. It was terrible the sufferings of these people, just for not standing on a cross. It’s a historical suffering. This people has the capacity to suffer, and it is part of their dignity. Also today, when those elderly women were in front of me at mass, I thought that in that invasion there were young girls taken away to the barracks for to use them but they did not lose their dignity then. They were there today showing their faces, elderly, the last ones remaining. It’s a people strong in its dignity. But returning to the question about the martyrs, the suffering and also these women, these are the fruits of war! Today we are in a world at war, everywhere. Someone said to me, Father do you know that we are in the Third World War, but bit by bit. He understood! It’s a world at war in which these cruelties are done. I’d like to focus on two words. First, cruelty. Today children do not count. Once they spoke about a conventional war, today that does not count. I’m not saying that conventional wars were good things, but today a bomb is sent and it kills the innocent, the guilty, children, women they kill everybody. No! We must stop and think a little about the level of cruelty at which we have arrived. This should frighten us, and this is not to create fear. An empirical study could be done on the level of cruelty of humanity at this moment should frighten us a little. The other word on which I would like to say something is torture. Today torture is one of the means, I would say, almost ordinary in the behavior of the forces of intelligence, in judicial processes and so on. Torture is a sin against humanity, is a crime against humanity. And I tell Catholics that to torture a person is a mortal sin, it’s a grave sin. But it’s more, it’s a sin against humanity. Cruelty and torture! I would like very much if you, in your media, make a reflection: How do you see these things today? How do you see the cruelty of humanity, and what do you think of torture. I think it would do us all good to reflect on this. Q. You have a very demanding rhythm, full of commitments and take little rest, and no holidays, and you do these trips that are massacring. And in these last months we see that you have also had to cancel some of these engagements, even at the last moment Is there something to be concerned about in the life you lead? Once I read a book. It was quite interesting, it’s title was: “Rejoice that you are neurotic”. I too have some neuroses. But one should treat the neuroses well. Give them some mate (herbal drink) every day. One of the neurosis is that I am too attached to life. The last time I took a holiday outside Buenos Aires was with the Jesuit community in 1975. But I always take holidays. It’s true. I change rhythm. I sleep more, I read the things I like. I listen to music. That way I rest. In July and part of August I did that. The other question. Yes, it is true, I had to cancel (engagements). The day I should have gone to the Gemelli (Hospital), up to 10 minutes before I was there, but I could not do it. It is true, they were seven very demanding days then, full of engagements. Now I have to be a little more prudent. Q. 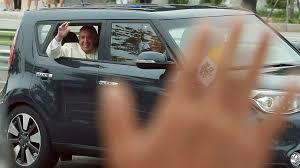 In Rio when the crowds chanted Francesco, Francesco, you told them to shout Christ, Christ. How do you cope with this immense popularity? How do you live it? A. I don’t know how to respond. I live it thanking the Lord that his people are happy. Truly, I do this. And I wish the People of God the best . I live it as generosity on the part of the people. Interiorly, I try to think of my sins, my mistakes, so as not to think that I am somebody. Because I know this will last a short time, two or three years, and then to the house of the Father. And then it’s not wise to believe in this. I live it as the presence of the Lord in his people who use the bishop, the pastor of the people, to show many things. I live it a little more naturally than before, at the beginning I was a little frightened. But I do these thing, it comes into my mind that I must not make a mistake so as not to do wrong to the people in these things. A little that way. Q. The Pope has come from the end of the world and lives in the Vatican. Beyond Santa Marta about which you have talked to us, about your life and your choices. How does the Pope live in the Vatican? They’re always asking us: “What does he do? How does he move about? Does he go for a walk? They have seen that you went to the canteen and surprise us. What kind of life do you lead in Santa Marta, besides work? A. I try to be free. There are work and office appointments, but then life for me, the most normal life I can do. Really, I’d like to go out but it’s not possible, it’s not possible, because if you go out people will come to you. That’s the reality. Inside Santa Marta I lead the normal life of work, of rest, chatting and so on. Q. Don’t you feel like a prisoner? A. At the beginning yes, but now some walls have fallen. For example, before it was said but the Pope can’t do this or this. I’ll give you an example to make you laugh. When I would go into the lift, someone would come in there suddenly because the Pope cannot go in the lift alone. So I said, you go to your place and I’ll go in the lift by myself. It’s normality. Q. I’m sorry Father, but I have to ask you this question as a member of the Spanish language group of which Argentina is a part. Your team – San Lorenzo, won the championship of America for the first time this week. I want to know how you are living this, how you are celebrating. I hear that a delegation are bringing the cup to the public audience on Wednesday, and that you will receive them in the public audience. A. After Brazil got the second place, it’s good news. I learned about it here. They told me in Seoul. And they told me, they’re coming on Wednesday. It’s a public audience and they will be there. For me San Lorenzo is the team, all my family were supporters of it. My Dad played basketball at San Lorenzo; he was a player in the basketball team. And as children we went with him, and Mama also came with us to the Gazometer. Today the team of ’46 was a great team and won the championship. I live it with joy. Not a miracle, no! Q. There’s been talk for a long time about an enc cyclical on ecology. Could you tell us when it will be published, and what are the key points? A. I have talked a lot about this encyclical with Cardinal Turkson, and also with other people. And I asked Cardinal Turkson to gather all the input that have arrived, and four days before the trip, Cardinal Turkson brought me the first draft. It’s as thick as this. I’d say it’s about a third longer than Evangelii Gaudium. It’s the first draft. It’s not an easy question because on the custody of creation, and ecology, also human ecology,one can talk with a certain security up to a certain point, but then the scientific hypotheses come, some sufficiently secure, others not. And in an encyclical like this, which has to be magisterial, one can only go forward on the things that are sure, the things that are secure. If the Pope says the centre of the universe is the earth and not the sun, he’s wrong because he says a thing that is scientifically not right. That’s what happens now. So we have to do the study now, number by number, and I believe it will become smaller. But going to the essentials, to that which one can affirm with security. One can say, in footnotes, that on this there is this and that hypothesis, to say it as information but not in the body of an encyclical that is doctrinal. It has to be secure. Q. Thank you so much on your visit to South Korea. I’m going to ask you two questions. The first one is this: just before the final mass at the cathedral you consoled some comfort women there, what thought occurred to you? And my second question , Pyongyang sees Christianity as a direct threat to its regime and its leadership and we know that some terrible thing happened to North Korean Christianity but we don’t know exactly what happened. Is there any special approach in your mind to change North Korea’s approach to North Korea’s Christianity? A. On the first question I repeat this. Today, the women were there and despite all they suffered they have dignity, they showed their face. I think, as I said a short time ago, of the suffering of the war, of the cruelty of the one who wages war. These women were exploited, the were enslaved, all this is cruelty. I thought of all this, and of the dignity that they have and also how much they suffered. And suffering is an inheritance. The early fathers of the Church said the blood of the martyrs if the seed of Christians. 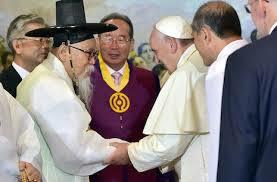 You Koreans have sown much, much, and out of coherence one now sees the fruit of that seed of the martyrs. About North Korea, I know it is a suffering, and one I know for sure, there are many relatives that cannot come together, that’s a suffering, but it a suffering of that division of the country. Today in the cathedral when I put on the vestments for mass there was a gift that they gave me, it was a crown of the thorns of Christ made from the iron wire that divides the two parts of the one Korea. 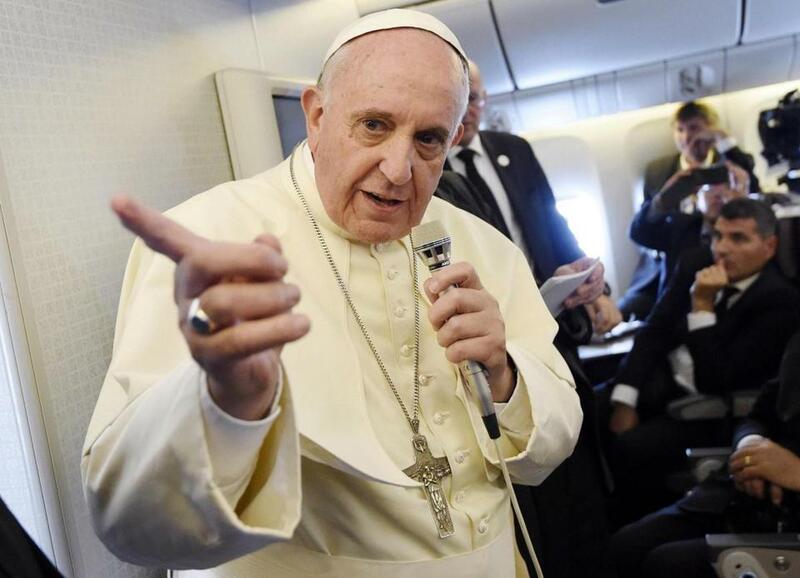 We are now taking it with us on the plane, it’s a gift that I take, the suffering of division, of a divided family, but as I said yesterday, I can’t remember exactly, but talking to the bishops, I said we have a hope: the two Koreas are brothers, and they speak the same language. They speak the same language because they have the same mother, and that gives us hope. The suffering of the division is great, I understand that and I pray that it ends. Q. As an Italo American I want to compliment you for your English, you should have no fear, and if you wish to do some practice before you go to America, my second homeland, I am willing to help. My question is this: You have spoken about martyrdom. At what stage is the process for the cause of Archbishop Romero. And what would you like to come out of this process? A. The process was blocked in the Congregation for the Doctrine of the Faith “ for prudence”, it was said. Now it is unblocked and it is in the Congregation for Saints and follows the normal path of a process. It depends on how the postulators move, it’s very important to move in haste. What I would like is to have clarified when there is martyrdom in ‘odium fidei’ (out of hate for the faith), whether it is for confessing the credo or for performing the works that Jesus commands us to do for our neighbor. This is a work of theologians that is being studied. Because behind him (Romero), there is Rutillio Grande and there are others. There are other that were also killed but are not at the same height as Romero. This has to be distinguished theologically. For me, Romero is a man of God. He was a man of God but there has to be the process, and the Lord will have to give his sign (of approval). But if He wishes, He will do so! The postulators must move now because there are no impediments. Q. 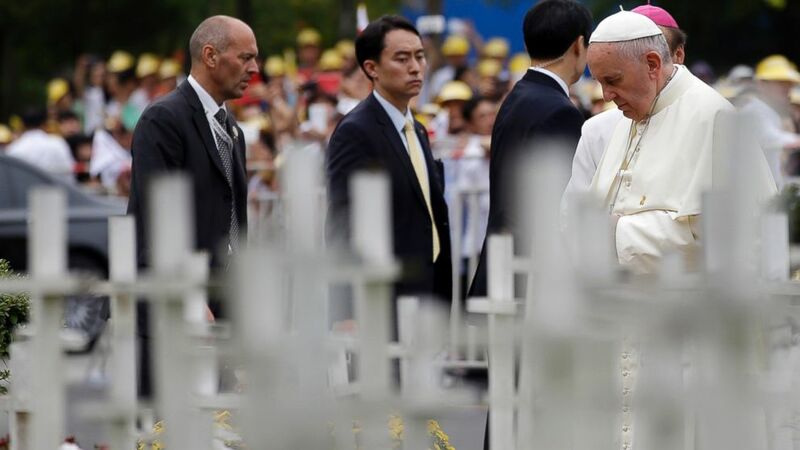 Given what has happened in Gaza, was the Prayer for Peace held in the Vatican on June 8 a failure? A. That prayer for peace was absolutely not a failure. First of all, the initiative did not come from me. The initiative to pray together came from two presidents: the President of the State of Israel and the President of the State of Palestine. They make known to me this unease, then we wanted to hold it there (in the Holy Land), but we couldn’t find the right place because the political cost for each one was very high if they went to the other side. The Nunciature was a neutral place, but to arrive at the nunciature the President of Palestine would have had to enter in Israel, so the thing was not easy. Then they said to me, let us do it in the Vatican, we will come. These two men are men of peace, they are men who believe in God, and they have lived through many ugly things, they are convinced that they only way to resolve the situation there is through dialogue, negotiation, and peace. You ask me, was it a failure? No, the door remains open. All four, the two Presidents and Bartholomew 1, I wanted him here as the ecumenical patriarch of Orthodoxy, it was good that he was with us, the door of prayer was opened. And it was said we must pray, peace is a gift of God,. It is a gift but we merit it with our work. And to say to humanity that the path of dialogue is important, negotiation is important, but there is also that of prayer. Then after that, we saw what happened. But it was just a matter of coincidence. That encounter for prayer was not conjuncture. It is a fundamental step of the human attitude, now the smoke of the bombs and the war do not let one see the door, but the door was left open from that moment. And as I believe in God, I look at that door and the many who pray and who ask that He helps us. I liked that question. Thank you! This entry was posted in Uncategorized and tagged Pope Francis. Bookmark the permalink.